In this paper, we introduce fractional-order into a model of HIV-1 infection of CD4+ T cells. We study the effect of the changing the average number of viral particles N with different sets of initial conditions on the dynamics of the presented model. Generalized Euler method (GEM) will be used to find a numerical solution of the HIV-1 infection fractional order model. At the present time there are several countries, particularly in Africa, with up to 35% of their populations between the ages of 15 and 50 years infected by human immunodeficiency virus (HIV) . Throughout the world, already over 16 million deaths have been caused by this virus. HIV is a retrovirus that targets the CD4+ T lymphocytes, which are the most abundant white blood cells of the immune system. Although HIV infects other cells also, it wreaks the most havoc on the CD4+ T cells by causing their decline and destruction, thus decreasing the resistance of the immune system [2, 3]. Mathematical models have been proven valuable in understanding the dynamics of HIV infection [4–6]. In 1989, Perelson developed a simple model for the primary infection with HIV . This model has been important in the field of mathematical modeling of HIV infection, and many other models have been proposed, which take this model as their inspiration. Perelson et al. extended the model in 1993 and discussed some of the model's behavior . They defined the model by considering four categories: uninfected CD4+ T cells, latently infected CD4+ T cells, productively infected CD4+ T cells and virus population. d x d t = s - μ x - β x z , d y d t = β x z - ν y , d z d t = c y - γ z - β x z .
d x d t = s - μ x - β x z , d y d t = β x z - ν y , d z d t = c y - γ z .
d T d t = s - K V T - d T + b I , d I d t = K V T - ( b + δ ) I , d V d t = N δ I - c V .
T 0 = T 0 , I 0 = I 0 , V 0 = V 0 . In this model, T, I and V denote the concentration of uninfected CD4+ T cells, infected CD4+ T cells, and free HIV virus particles in the blood, respectively. δ represents death rate of infected T cells and includes the possibility of death by bursting of infected T cells, hence δ ≥ d. The parameter b is the rate at which infected cells return to uninfected class while c is death rate of virus and N is the average number of viral particles produced by an infected cell. The rest of the paper is organized as follows. Section 2 gives an idea about fractional calculus. In section 3, we introduce fractional-order into the model that describes HIV infection of CD4+ T cells. Section 4 gives an idea about the generalized Taylor's formula while section 5 presents the idea of generalized Euler's method for solving FODEs. Section 6 is devoted for the numerical results. Fractional calculus has been extensively applied in many fields [13, 14]. Many mathematicians and applied researchers have tried to model real processes using the fractional calculus. Jesus, Machado and Cunha analyzed the fractional order dynamics in botanical electrical impedances [15, 16]. Petrovic, Spasic and Atanackovic developed a fractional-order mathematical model of a human root dentin. In biology, it has been deduced that the membranes of cells of biological organism have fractional-order electrical conductance  and then are classified in groups of non-integer order models. Fractional derivatives embody essential features of cell rheological behavior and have enjoyed greatest success in the field of rheology . Fractional order ordinary differential equations are naturally related to systems with memory which exists in most biological systems. Also, they are closely related to fractals, which are abundant in biological systems. Hence, we propose a system of FODE for modeling HIV. We first give the definition of fractional-order integration and fractional-order differentiation . There are several approaches to the generalization of the notion of differentiation to fractional orders e.g. Riemann-Liouville, Caputo and Generalized Functions approach. For the concept of fractional derivative, we will adopt Caputo's definition, which is a modification of the Riemann-Liouville definition and has the advantage of dealing properly with initial value problems. Where J0f(x) = f(x), α > 0, x > 0. Where m-1 < α ≤ m, m ∈ N.
The reason of using fractional order differential equations is that they are naturally related to systems with memory which exists in most biological systems. Also they are closely related to fractals which are abundant in biological systems. The definition of fractional derivative involves an integration which is non local operator (as it is defined on an interval) so fractional derivative is a non local operator. In other word, calculating time fractional derivative of a function f (t) at some time t = t1 requires all the previous history, i.e. all f (t) from t = 0 to t = t1 The results derived of the fractional systems are of a more general nature. However, the fundamental solutions of these equations still exhibit useful scaling properties that make them attractive for applications. We would like to put your attention that time fractional derivatives change also the solutions we usually get in standard system. The concept of fractional or non-integer order derivation and integration can be traced back to the genesis of integer order calculus itself. Most of the mathematical theory applicable to the study of non-integer order calculus was developed through the end of 19th century. However it is in the past hundred years that the most intriguing leaps in engineering and scientific application have been found. The calculation technique has in some cases had to change to meet the requirement of physical reality. The derivatives are understood in the Caputo sense. The general response expression contains a parameter describing the order of the fractional derivative that can be varied to obtain various responses. One of the basic reasons of using fractional order differential equations is that "Fractional order differential equations are, at least, as stable as their integer order counterpart." D α 1 ( T ) = s - K V T - d T + b I , D α 2 ( I ) = K V T - ( b + δ ) I , D α 3 ( V ) = N δ I - c V .
In this section we introduce a generalization of Taylor's formula that involves Caputo fractional derivatives. This generalization is presented in . With 0 ≤ ξ ≤ x, ∀ x ∈ (0, a]. In case of α = 1, the generalized Taylor's formula (6) reduces to the classical Taylor's formula. For 0 < α ≤ 1, t > 0.
for j = 0, 1,...,k-1. It is clear that if α = 1, then the generalized Euler's method (9) reduces to the classical Euler's method. We will solve the system (5) by using (GEM). Consider that α1 = α2 = α3 = α. We used the following data set: s = 10, b = 0.2, k = 0.000024, d = 0.01, δ = 0.16, c = 3.4, N varies. For this set of data R0 = 3.13 when N = 1000 (Figures 1, 2, 3, 4, 5, 6) and R0 = 5.01 when N = 1600 (Figures 7, 8, 9, 10, 11, 12). The initial conditions in the first case study are T(0) = 1000, I(0) = 0, V(0) = 0.001 while in the second case are T(0) = 1000, I(0) = 10, V(0) = 10. In the two cases the system goes to infected steady state. 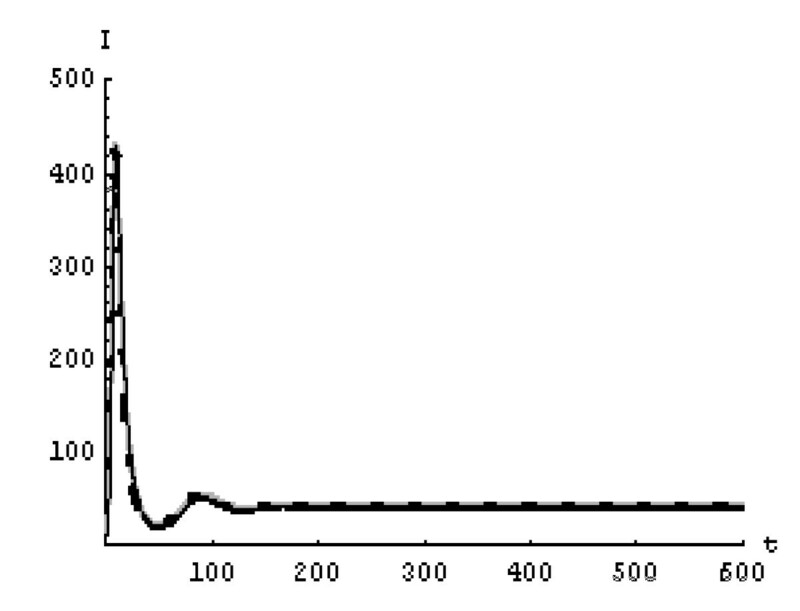 The concentration of the uninfected CD4 + T cells at N = 1000 in the 1 st case. 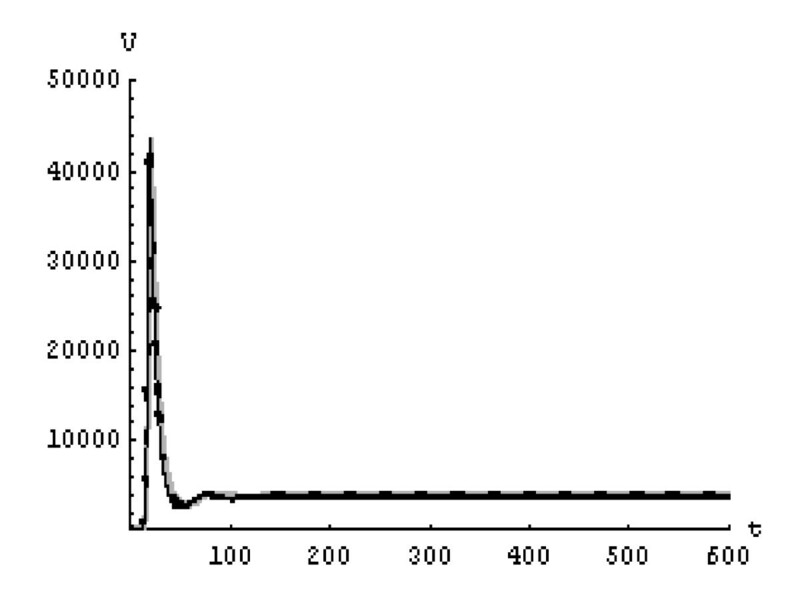 Gray solid line (α = 1), Dotted line (α = 0.99), Black solid line (α = 0.95). 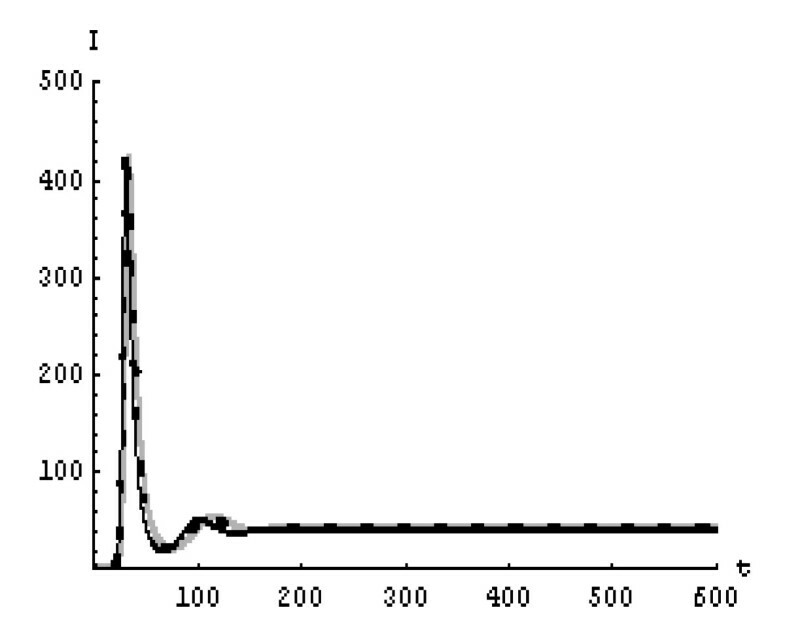 The concentration of the infected CD4 + T cells at N = 1000 in the 1 st case. Gray solid line (α = 1), Dotted line (α = 0.99), Black solid line (α = 0.95). 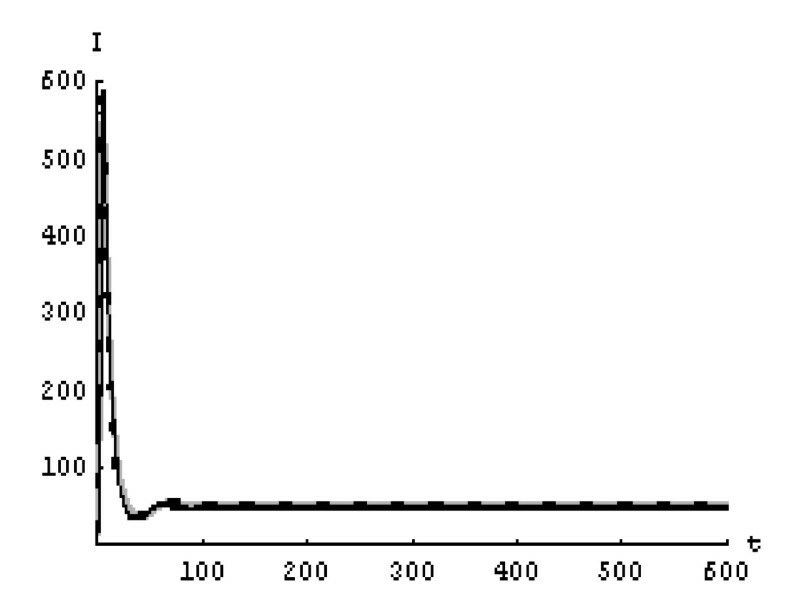 The concentration of the free HIV virus particles at N = 1000 in the 1 st case. 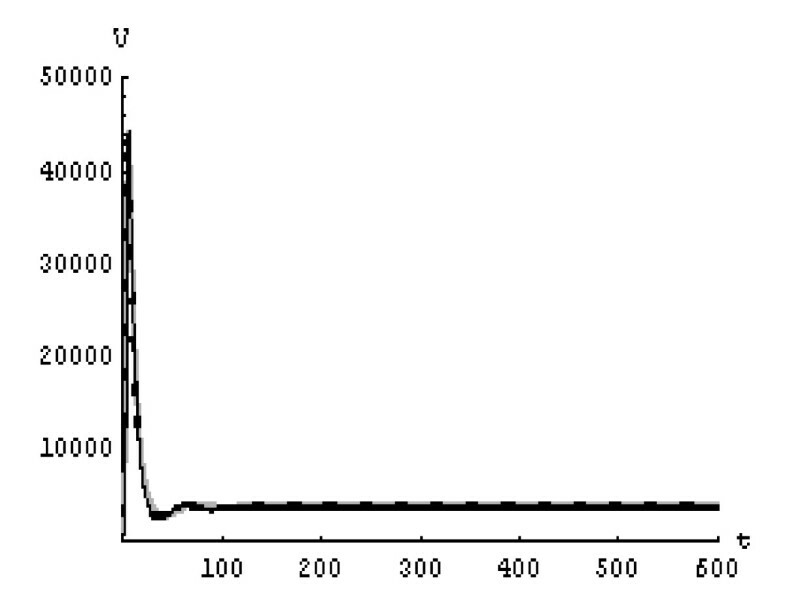 Gray solid line (α = 1), Dotted line (α = 0.99), Black solid line (α = 0.95). 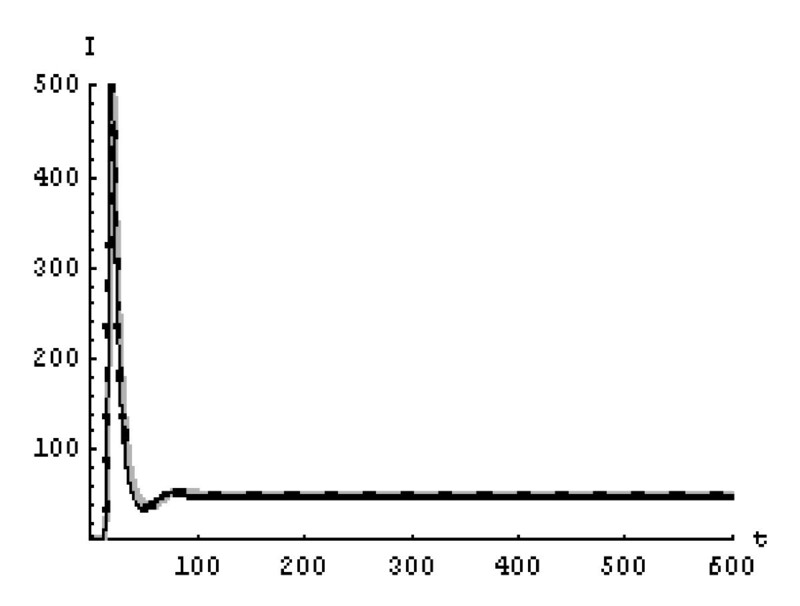 The concentration of the uninfected CD4 + T at N = 1000 in the 2 nd case. 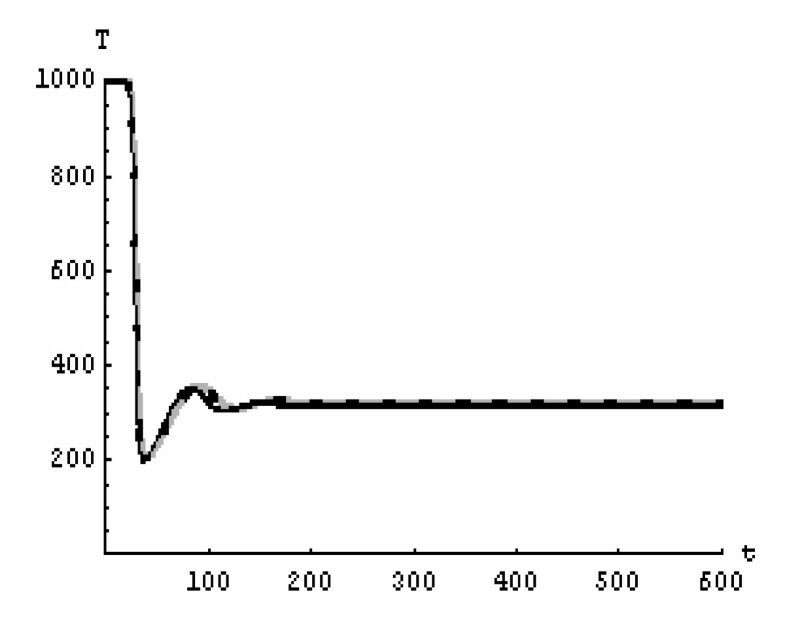 Gray solid line (α = 1), Dotted line (α = 0.99), Black solid line (α = 0.95). 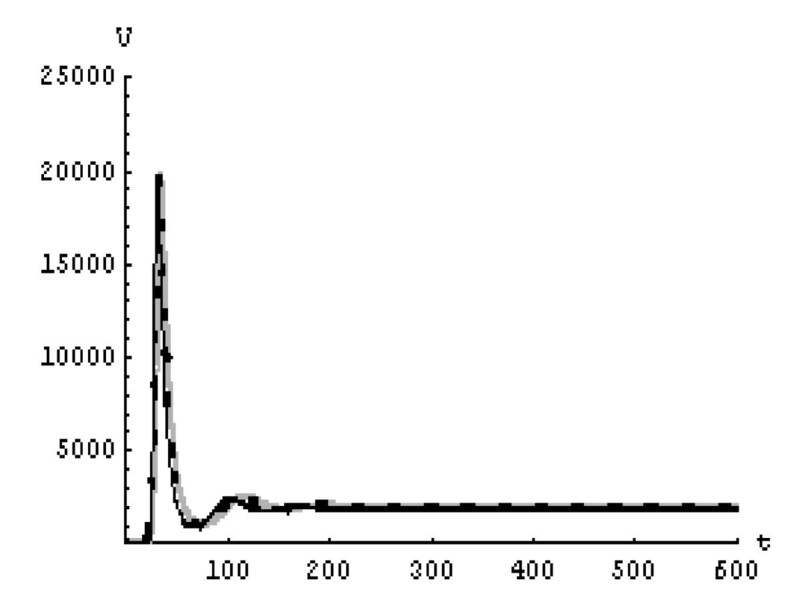 The concentration of the infected CD4 + T at N = 1000 in the 2 nd case. 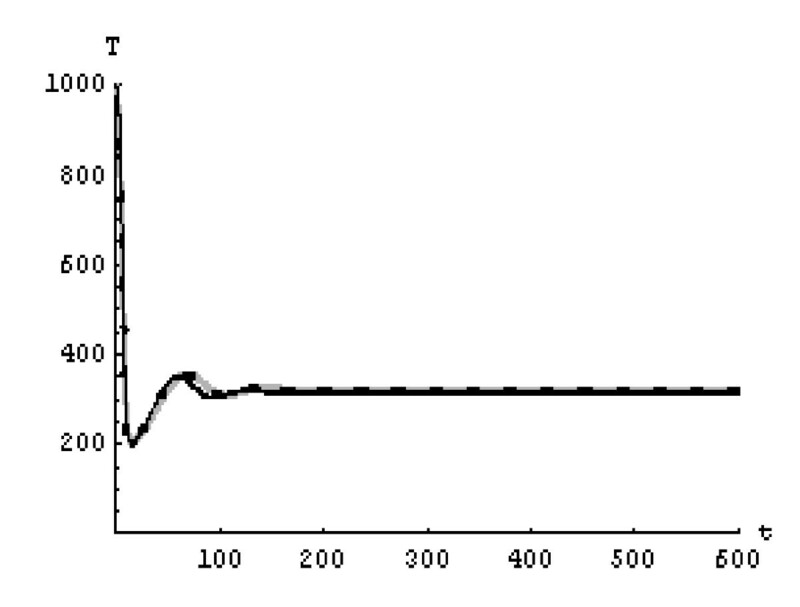 Gray solid line (α = 1), Dotted line (α = 0.99), Black solid line (α = 0.95). The concentration of the free HIV virus particles at N = 1000 in the 2 nd case. Gray solid line (α = 1), Dotted line (α = 0.99), Black solid line (α = 0.95). The concentration of the infected CD4 + T cells at N = 1600 in the 1 st case. Gray solid line (α = 1), Dotted line (α = 0.99), Black solid line (α = 0.95). The concentration of the free HIV virus particles at N = 1600 in the 1 st case. 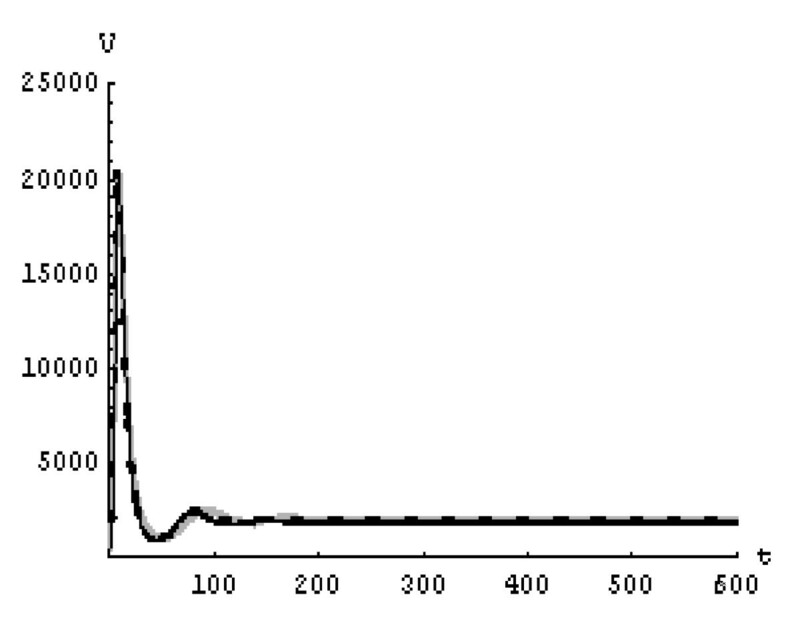 Gray solid line (α = 1), Dotted line (α = 0.99), Black solid line (α = 0.95). The concentration of the uninfected CD4 + T cells at N = 1600 in the 2 nd case. Gray solid line (α = 1), Dotted line (α = 0.99), Black solid line (α = 0.95). 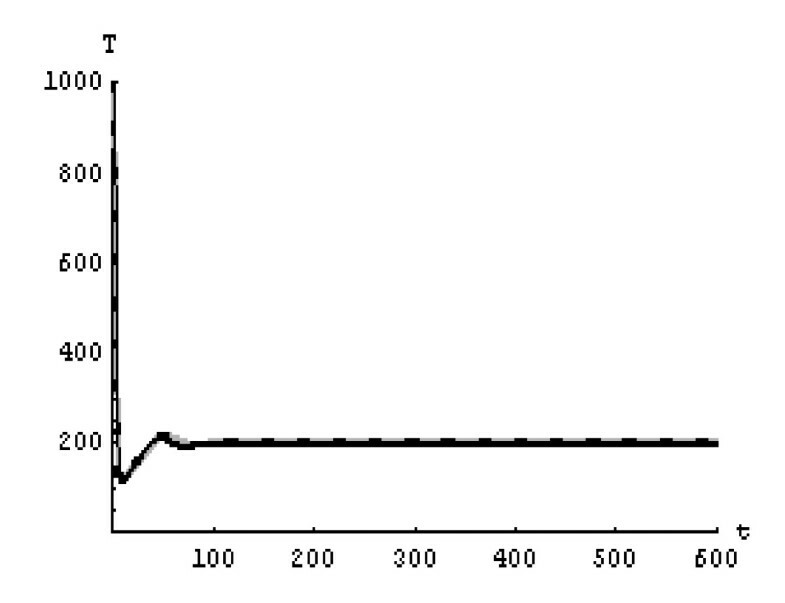 The concentration of the infected CD4 + T cells at N = 1600 in the 2 nd case. Gray solid line (α = 1), Dotted line (α = 0.99), Black solid line (α = 0.95). The concentration of the free HIV virus particles at N = 1600 in the 2 nd case. 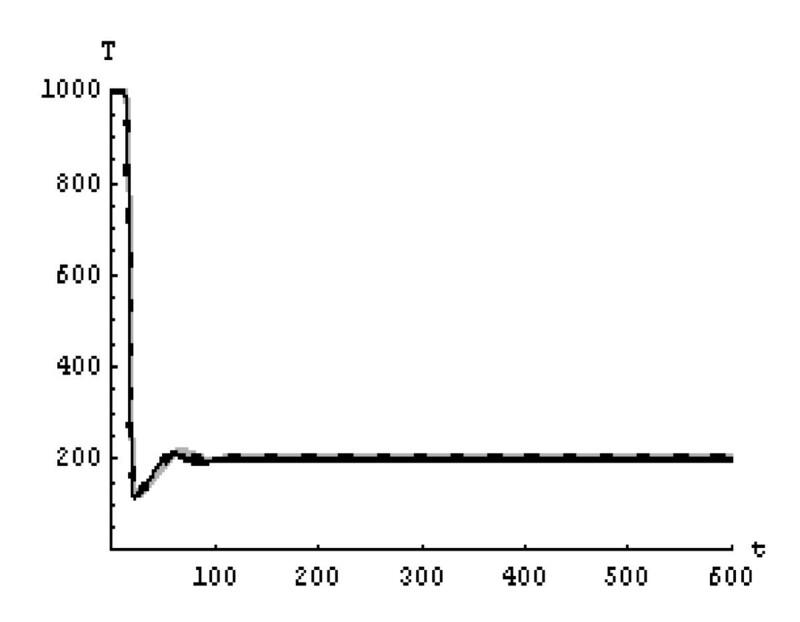 Gray solid line (α = 1), Dotted line (α = 0.99), Black solid line (α = 0.95). It represents the average number of secondary infection caused by a single infected T cell in an entirely susceptible T cell population, throughout its infectious period. For system (5), if the basic reproduction number R0 ≤ 1, the the virus is cleared and no HIV infection persists. If R0 > 1, the HIV infection persists in the T-cell population. In the two presented cases, R0 = 3.13 when N = 1000, (see Figures 1, 2, 3, 4, 5, 6) and R0 = 5.01 when N = 1600 (see Figures 7, 8, 9, 10, 11, 12), so the system goes to infected steady state. It is clear from the definition of R0 that R0 decreases as the reverting rate, b of infected cells increases, hence R0 can be low for a high parametric value of b. Increasing the N value will decrease the numbers of uninfected CD4+ T-cells and increase the number of free virus substantially, but does not change the stability of the steady state. The concentration of susceptible CD4+ T cells T(t), infected CD4+ T cells I(t), and free HIV virus particles V(t) in the blood have been obtained, therefore when α → 1 the solution of the fractional model (5) Tα (t), Iα(t), Vα(t), reduce to the standard solution T(t), I(t), V(t). Finally, the recent appearance of fractional differential equations as models in some fields of applied mathematics makes it necessary to investigate methods of solution for such equations (analytical and numerical) and we hope that this work is a step in this direction. AA projected and coordinated the numerical experiments. SR participated the main computer programming. MK performed the numerical simulation. All authors read and approved the manuscript.